Do hacks really work? Well I think they do. In 2012 I attended the #digidoc2012 conference in London. This was a conference aimed at bringing clinicians and technology enthusiasts together to learn how better to use technology to help in a clinical setting. Part of the day included tutorials and lectures, but my favourite part was the ‘hack’ session. In groups, we pitched ideas about potential apps which could be created to help different groups i.e. clinicians, patients, providers etc. From this session the initial concept of PhotoConsent : Medical Photography 2.0 – was formed. Medical photography in a hospital setting can be relatively straight forward. A clinician can call up the medical photography department, get them to sort out the forms and details, patient consented, picture taken…done. The main issue with this is the time taken to access the medical photography department. Medical photography in a moderately acute setting or primary care is considerably less straight forward. Issues on how you document the consent, what methods used (verbal or written) and how this is stored need to be considered. There exists some guidance on the matter (see Good Medical Practice: Making and using visual and audio recordings of patients), however actual practice is variable. The added issue of social media and the ease of which images can now be shared can add to the confusion. I am involved in several on-line fora and governance groups. With seeing interactions about patient images in social media and various online clinical groups, I felt a more complete solution was needed which gave better protection and governance for both patients and clinicians. Following the #digidoc12 conference (http://thedigitaldoc.co.uk/), I met some innovative colleagues including Ed Wallit (@podmedicsed). We took this brainstormed idea further and now we have a finished product- PhotoConsent app. 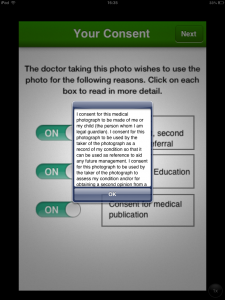 PhotoConsent is a new application designed to help you as a clinician to safely and easily take photos of a patient and then obtain the relevant consent for that photo quickly and efficiently. It is currently available on iOS. Upon opening the app you can take a photo from the home screen. 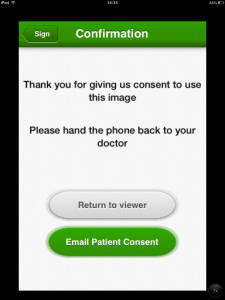 Once you have confirmed you have the best possible image, you and the patient are shown the consent options. Using PhotoConsent you can choose to obtain consent to use the photo for assessment, second opinion or referral, educational use or publication. In real time with the patient you can then select each consent option to explore in more detail to allow informed consent. This consent can then be digitally signed and emailed to the patient instantly. The image and consent can then be used by the clinician in accordance with GMC guidance. This can be via the app, email or via the online portal: PhotoConsent.co.uk . What makes PhotoConsent unique is that the consent is digitally secure in the metadata of the image. So proof of consent is always with the image. Why should I use PhotoConsent? It is important if taking a medical image of a patient, that consent is obtained and recorded. Written consent is considered the best option. 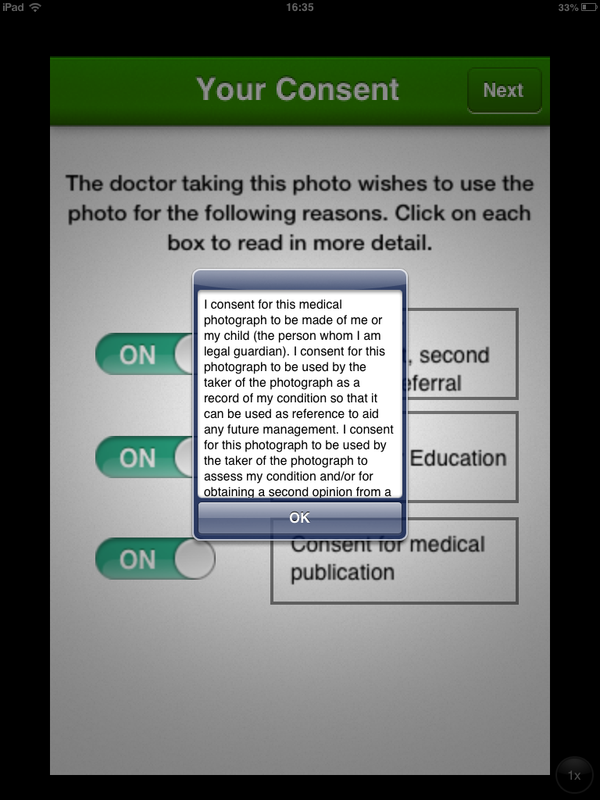 PhotoConsent allows you to take consent with the patient in real-time, forward the patient a copy of the consent so they can stay informed, and be safe in the knowledge that consent is secure within the image metadata. All this is possible through your own iOS device making it convenient and effective for all involved. What is next for PhotoConsent? The first release of PhotoConsent is out, but there can always be progression. In the future I hope to bring the app to the Android platform to make it more accessible to a wider audience. We are also working on expanding the app to include consent for non-medical use. We have a few other ideas and an upcoming update including iOS7 compliant, but time will tell if these are possible.